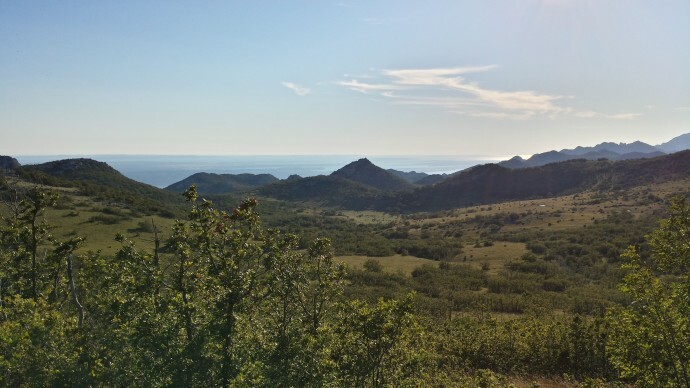 Malo Libinje is a rugged, stony part of the Velebit Mountains in Croatia, that borders the Paklenica National Park and overlooks the sea. It is also the home of the Knežević family. I was there to observe the behaviour of the Istrian Boškarin cattle that they received earlier this year through Rewilding Europe. The Knežević family kindly and graciously accepted me as a guest from America. A view of the sea, shrubby terrain and the main pasture area grazed by the livestock owned by the Knežević family. My stay was arranged by Davor Krmpotić, the devoted team leader of Rewilding Velebit after I expressed interest to volunteer during an extended visit to my family in Croatia (aka, Hrvatska). When Davor and I discussed the project and the region before my arrival, the only things that concerned me were the poisonous snakes – namely, Vipera ammodytes (common name: poskok) – and the wolves that regularly prey on the Knežević horses. One of the family members, Milan, and I stood at the top of the hill on which the Knežević family farm sits, overlooking the main pasture and grazing valley for the horses, cows and Boškarin cattle. We noticed a hiker steadfastly moving up the side of the hill below us who took a break from the long walk from Modrić, a town at sea-level some 20 km away, to talk to us. He was heading to Sveto Brdo (Holy Hill), which can be seen from where we were standing and to which people often make a pilgrimage. It was then that I realized that the Knežević farm was located in the middle of a web of hiking trails and that hikers and passers-by were not uncommon in this remote place. 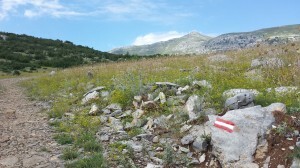 While snake bites and, more commonly, exposure to the cold mountain wind from the north (bura) are real dangers on the mountain, tourists readily traverse the terrain using the existing walking trails. Sveto Brdo, the peak in the background, is a place of pilgrimage for many travelers. One type of trail blaze – a white line sandwiched between two red stripes– is visible in the foreground. We continued to watch the Boškarin and horses grazing in the valley into the late morning. The two species grazed in cliques, but not far from each other. The second youngest of the Boškarin herd approached a foal, perhaps to incite play, and was quickly warned away by the foal’s mother. This skirmish was quickly forgotten as two off-road vehicles slowly drove down to the valley and parked on its periphery. The horses and the Boškarin cautiously moved in the direction of the people exiting the vehicles. Photo safaris are a regular noon-time occurrence in the valley bringing tourists from Starigrad to take photos of and experience Velebit’s many charms. At mid-day, we walked back to the house for lunch. The Knežević family consists of Petar, his wife Marijana, their three delightful girls (Petra, Antonija, and Paula), and Petar’s parents. Marijana and the girls were in town at the base of the mountain taking care of errands, but were to return later that day. Petar’s mother was preparing lunch. The lunch party also included a couple of Petar’s friends. A German hiker also joined, having lost his way on the trail. He was miles off but Petar and his friends spoke German and told him how to get back on the path he intended. We talked about the hunting culture that was once prevalent in the region as well as the old but still practiced migrations of the people with the change in seasons. For example, Petar’s parents and others would spend warm summer months in the hills and valleys tending to the livestock and farms, but once the weather changed in the fall they would start to move the herds further down the slope to graze until they reached sea level, where they would wait out the winter. Petar, on the other hand, has chosen to stay in the hills year-round. He grew up in the mountains; he knows the terrain well and the needs of the livestock like his own. Later, I recorded data from each individual Boškarin’s personal documentation, which contained the individual’s unique number, name, parents’ information, date of birth, and owners. Twelve Boškarin arrived at the Knežević farm in April 2014; the thirteenth (Bambi) was born almost a month ago. All were female except an eight-month male called Moro who was attacked by wolves but defended himself and got away having lost just the tip of his tail. I found a walking stick and decided to walk along the dusty, rocky road lined with tall grasses, shrubs, and rocks. I often thought about the poskok. I watched ahead of every step and when I stopped to look up I would see the idyllic mountain scene that draws so many people to Velebit. How else can anyone describe such beauty, except in the simple terms of my morning companion, gušt i milina, which means to feel heartfelt joy and peace? Once I returned to the house I asked for a measuring tape so that I might measure the height of the Boškarin herd, from the base of a front quarter to the highest point just above the shoulder. The herd had just walked up to the stable from pasture for water; now was the ideal time to collect the data. Petar enclosed the herd in the stable. Though each of the mature Boškarin could easily move me aside, they were fearful and skittish, pushing each other in the confined space as we approached with the measuring tape. Our persistence paid off and we obtained the measurements. A delicious dinner was ready shortly after and, as always, accompanied by gemišt (white wine and carbonated water), bevanda (red or white wine and water), and bambus (red wine and cola). Once the sun set, the waxing moon, Milky Way, and shooting stars were clearly visible in the night sky. Rewilding Europe note: The Boškarin cattle here are a part of the Tauros project, an initiative by the Taurus Foundation, supported by Rewilding Europe, with the ambition to backbreed a functional, wild version of the aurochs, which went extinct as a wild animal in 1627. Since all the aurochs DNA is still alive, but now spread out over a number of ancient cattle breeds, the idea is to try to bring it back. The Boškarin is one of those ancient breeds that carry important parts of the aurochs DNA. This is a process in several steps and Petar’s farmstead represents one of the first, to create a breeding stock of animals that are slowly becoming more and more used to life in the wild. These will later be crossed with animals from some of other cattle breeds that are close to the aurochs, like Sayaguesas from Spain or Maremmanas from Italy.